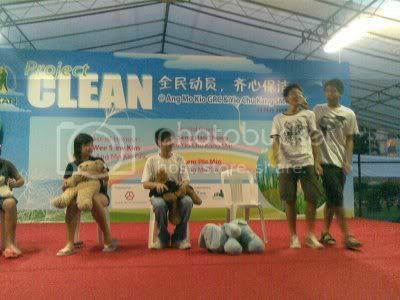 This is the video of five members from The ESS army performing a replica of the same skit that we have done on 25th May ,A Clean And Healthy Me on stage at AMK Ave 4 Block 177 Block Party.As you can see,we have a different cast of actor as compared to the initial one at Ang Mo Kio Blk 548 on 25th May. We want to equip all our member with the skill to act in the skit and spread the message of the need for care for our environment. This is necessary to empower a sustainable society,having the 'younger" generation to take over the "older" generation for the spreading our message of environmental awareness.In our school,Mayflower Secondary School,we already have younger Youth Environmental Guardian in secondary 1,2 and 3s. 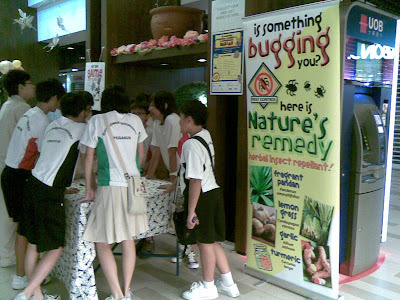 On 28 June 2008, The ESS Army went to Block 177 to do a skit promoting cleanliness and health, and at the same time, sold bottles of Shoo Mozzie, our all-natural insect repellent to the community. Please support the ESS Army by following these simple steps! 2. Click on the VOTE button on the front page. 3. Scroll down and click the VOTE button beside our blog "Global Coolers"
Many people have asked: "What does the ESS in The Ess Army stands for?" Well, today, I'm going to tell you just what it stands for! "ESS" is an acronym for our motto: Empowering a Sustainable Society. Let me further elaborate on this. Our current society is not very pleasent. Pollution are found in almost every developed country, and some undeveloped ones too. Now, if this carries on, we won't have a society at all. 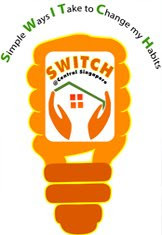 Our aim is to empower the society so that they will practice habits that will not damage the environment. This way, we can sustain a society in which both the flora and fauna are able to live together, without drastic consequences. We achieve this aim by using the 3P's: People, Programme, Passion. The Ess Army have been inviting and working with many people, groups and organisation. 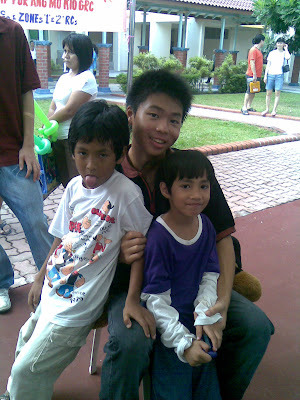 The few I would love to highlight is Uncle Joe (Joseph Lai) and Dr D'Rozario. The next person is Dr D'Rozario. Dr Vilma Drozario is a lecturer at National Institute of Education. Though it's not part of her job, she is also a very passionate environmentalist from young. We also interviewed her [link], and also asked for help on what are the things we can do to help spread the message. She is the co-founder of Cicada Tree Eco Place, an environmental NGO. Through this NGO we learn how to make Shoo Mozzie, an all natural insect repellent. We use our relationships with people to learn more of the environment, and what we can do. Through this, we have learn a lot, and have also done a lot more. For programmes, we have worked closely with the National Environmental Agency through a programe called the Youth Environmental Guardian. The title of the skit was "A Clean and Healthy Me"
Lastly we took a trip to Vietnam to learn about the harmful effects of insecticides and herbicides on the environment. We also have many other upcoming programmes and activities, such as the skit and selling of Shoo Mozzie at AMK Ave 4 Block 177 in partnership with Kebun Baru CC on the 28th June, the presentation to the school during CARE TALK on the 30th June, and the Singapore Garden Festival in Suntec City from the 25th to 1st Aug. We hope through these programmes, we can inspire and empower more people to join our cause and help fight against global warming. The last P, Passion, comes from the people involved in protecting the environment and helping to prevent climate change. These people include us, Uncle Joe, Dr D'Rozario, and many more. Their passion drive them to do whatever it takes to help protect the environment and prevent global warming. They will do it even if there's nothing for them. We sacrifice much of our time to help spread the word, even if there's nothing in it for us. Uncle Joe and Dr D'Rozario sacrificed their time to spend with us in hope that we will be able to have their passion, and continue the efforts to fight towards the common goal. I hope through this you will understand our group better, and realise your potential to be the saviour of mother earth. Congratulations to the Ess Army! 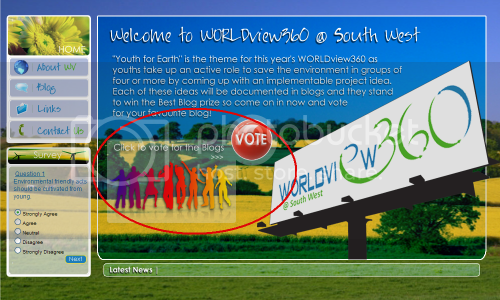 We've made it to the grand finale of the worldVIEW360 competition! However, our work doesn't end here. We shall do our best for both our community and our earth, and do our best to win the competition! Also, please note we'll be having a sale of Shoo Mozzie at block 117 this saturday in partnership with Kebun Baru CC. You will be further briefed tomorrow or friday. Also, good luck to all those taking your Chinese O Levels Oral exam the next few days. All the best of luck! Again, congratulations to us and all those who've helped us to come this far! How many floods must there be, before we know it too late? The answer my friend is blowing in the wind. Are you now convinced that the climate change has an impact on the environment. Below are three articles about flooding in India, USA and China all reported on the same day. How many more floods do we have to see before we do something about climate change? The answer my friend is in your hand. BEIJING - CHINA ordered emergency work to strengthen swollen dykes and reservoirs on Tuesday and evacuated tens of thousands of people as large swathes of the south reeled under their worst storms in decades. Officials said more than 40 rivers nationwide were exceeding their warning levels with torrential rain continuing to pound the densely populated region. The civil affairs ministry said the death toll in nine southern provinces and regions had reached 63 on Tuesday, with 13 missing, since the latest bout of rains began pummelling the area in early June. However, state-run Xinhua news agency said the flooding could have resulted in more than 200 dead or missing, citing the National Meteorological Centre. The centre declined comment when contacted by reporters. 'We must remain clear-headed and not under-estimate the serious nature of the current flood and disaster situation,' Vice Premier Hui Liangyu said, in comments on the website of the state flood prevention headquarters. In the prosperous Pearl River Delta region, parts of central Guangzhou and Shenzhen were under water and some of the tributaries were seeing their worst floods on record. 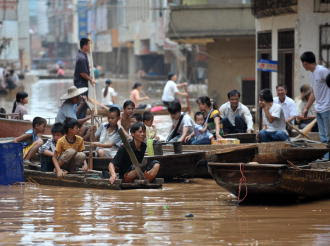 The China Daily quoted the civil affairs ministry as saying the storms and floods were the worst in decades. Officials also warned that the north could fall victim to the freak weather patterns. More than 1.66 million people have been evacuated in the hardest-hit areas, with large swathes of farmland under water and economic losses totalling 14.5 billion yuan (S$2.8 billion), the civil affairs ministry said. Vice Premier Hui ordered the immediate evacuation of people in danger areas and the strengthening of river dykes and reservoirs. 'We have to limit the loss of life and property to the lowest extent possible,' Mr Hui said. According to the flood headquarters, waters exceeded warning levels by 6.8 metres on the Xijiang river in Guangxi's Wuzhou city, where three rivers meet before flowing down into the Pearl River delta. Rains were expected to continue in the region this week. Guangxi's world-famous tourist city of Guilin was also under threat, while waters in towns and villages in the vicinity had reached the rooftops and many roads were cut off by rising flood waters or rain-induced landslides. In inland provinces such as Hunan, Hubei, Jiangxi and Sichuan, rains were also forecast to continue throughout the week, ensuring that downstream rivers would remain high, the state meteorological bureau said. In the north, the government urged the bolstering of dykes and reservoirs along the Yellow River, known as the 'cradle of Chinese civilisation' and home to millions of urban dwellers and farmers. 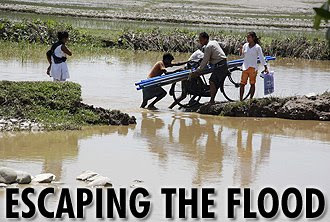 'National flood prevention and relief efforts are entering a crucial phase,' the flood headquarters said in a statement. Meanwhile, Prime Minister Wen Jiabao ordered an increase in efforts to prevent rain-induced landslides in Sichuan province, where an 8.0-magnitude earthquake in mid-May left 87,000 dead or missing and millions homeless. 'As aftershocks continue to hit and as rains markedly increase at the start of the rainy season, we must pay close attention,' Mr Wen said. BEIJING - THE risk of flooding in southern China's Guangdong province could worsen as a full moon, more rain and converging rivers threaten levees, the Xinhua news agency said on Tuesday citing local flood control officials. About a million people have already been displaced by flooding in neighbouring Guangxi, and 57 people killed across southern China by torrential rains. Run-off in the Xijiang and Beijiang rivers was much higher than normal at their junction in Foshan city, Xinhua said, with more rain expected upstream. Flooding has struck as far north as Longnan, on the southern tip of Gansu province, where 365 died and 1.8 million were left homeless after a devastating earthquake last month. 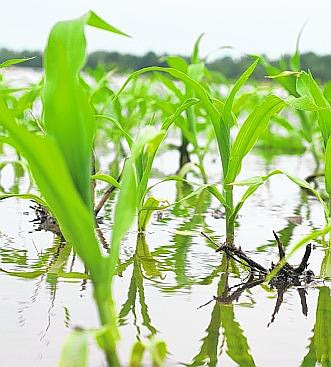 NEWHALL (IOWA) - HERE, in some of the best soil in the world, the stunted stalks of farmer Dave Timmerman's newly-planted corn are wilting in what sometimes look more like padi fields than the plains, the sunshine glinting off pools of water. Although time is running out, Mr Timmerman has yet to plant all of his soya bean crop because the waterlogged soil cannot support his footsteps, much less heavy machinery. His small farm has been flooded four times in the past month by a tributary of the Cedar River, which overflowed its banks last week, causing catastrophic damage in nearby Cedar Rapids and other towns and farmsteads across the state. At a time when corn should be almost waist-high in the United States' No. 1 corn state, Iowa has lost 530,000ha of corn and 810,000ha of soya beans. Some 16 per cent of the state's 10 million ha of tillable farmland is underwater. 'In the lean years, we had beautiful crops but they weren't worth much,' Mr Timmerman said, surveying the land that his family has tended for generations. All across the sodden, rain-soaked Mid-west, there are thousands - many of them other farmers - who are a lot worse off than Mr Timmerman. Since the beginning of this month, first tornadoes and then heavy rain and flooding, have cut a watery path across the region. And officials fear that worse flooding may lie ahead as rain-gorged tributaries spill into the Mississippi River system, threatening scores of other communities. But the plight of Mr Timmerman and thousands of other farmers who have seen their fields turn into flood plains goes beyond the Mid-west. Last week, the price of corn broke through the US$7 (S$9.60) a bushel price-point on the commodities futures market for the first time, and soya beans rose sharply too. Besides Iowa, the heavy-farming states of Illinois, Indiana, Wisconsin and Minnesota have suffered an unusual level of flooding this year. Soaring global demand in addition to the increased use of corn for ethanol, an alternative fuel, have shrunk the worldwide supply of staples that are the core of practically every continent's diet. Meanwhile, the price of oil has jumped, increasing the cost of producing crops, feeding livestock and causing an overall inflation of grocery bills here and abroad, sparking riots and protests in at least two dozen countries. 'The American farmer, we feed the world,' Mr Timmerman said. 'We're going to be short on corn and we're going to be short on soya beans. FLOOD-RAVAGED residents of the US mid-western state of Iowa were to start cleaning up yesterday, but officials warned it could be two weeks before river levels returned to normal. More than 11 million people in nine mid-western states were affected by the overflowing of the Iowa, Mississippi and Cedar rivers as well as the extreme weather of recent weeks, the Federal Emergency Management Agency said. Iowa was by the far the hardest hit: 83 of its 99 counties have been declared disaster areas and more than 4.8 million sandbags have been laid down to try to stem the tide. Damages were estimated to be in the billions of dollars. 'The waters will recede. Our citizens will rebuild and return to their homes. And Iowans will meet this challenge with optimism and resilience,' Governor Chet Culver said on Sunday. Officials put the death toll in Iowa at three, while harsh weather claimed five other lives elsewhere in the US Mid-west. The swollen Iowa River, which bisects Iowa City, was topping out at about 9.6m - 46cm below earlier predictions. But it still posed a lingering threat, and was not expected to begin receding until yesterday night. GUWAHATI - MONSOON rains swept across India's remote north-east, forcing hundreds of thousands of villagers from their flooded homes and killing at least 30 people, officials said on Tuesday. 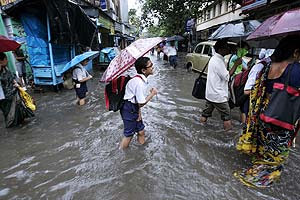 The monsoon arrived at least two weeks early in northern India, bringing respite to its baking plains, but in the north-eastern state of Assam it swamped about 500 villages in waist-deep water, leaving about 300,000 people homeless. Assam accounts for about 55 per cent of India's tea production. Officials said the rains had not affected tea trade. 'The (13) deaths were reported from North Lakhimpur town,' an Assam police official said. 'The situation turned worse because there has been erosion of embankments at 13 places,' said Mr Uken Pegu, an official with the Water Resources Department in Lakhimpur. SYDNEY - CLIMATE change threatens to devastate coral reef fish populations and increase the likelihood of fishery collapses, Australian researchers warned yesterday. Coral reefs' vulnerability to global warming has already been established by researchers, but the fish living in the reefs are also at risk, James Cook University's Centre for Excellence in Coral Reef Studies found. 'We have already seen episodes of mass die-off of corals as a result of warmer waters associated with global warming, the problem for specialist coral fish is that when the corals die, the fish have nowhere else to go,' the centre's Mr Philip Munday said. Mr Munday said there were some 4,000 fish species living in or around coral reefs, providing livelihoods and a major source of sustenance to an estimated 200 million people worldwide. Simple Ways I Take to Change my Habits. now could not be more timely and urgent. to make a huge difference in global warming. Save Our Environment & Money! is gobbling up the electricity in your home? We are working together with a group of Youth Environmental Guardians(YEGs) in our school to promote Shoo Mozzie to raise funds for ACRES which stands for Animal Concerns Research & Education Society. This is part of the YEGs project for the Citibank-YMCA Youth For Causes programme. This year, a new dimension has been added to the programme:- (a) Encouraging projects which promotes sustainable development, e.g. projects that helps Non Profit Organisations which are supporting environmental causes. Here is an article from the Straits Time about the founder of ACRES. WHEN Mr Louis Ng set up a welfare group here to improve the lot of wild animals, he was labelled a fanatic. Some thought he had a screw loose. Seven years later, he is no longer a voice in the wilderness. Acres, short for Animal Concerns Research & Education Society, has 12,000 volunteers and donors, Government funding and - this is crucial - status as an institution of public character, which allows donations to it to be tax-exempt. He has not only made the authorities sit up and take notice, he now works with them to nab those in the illegal wildlife trade. Acres is also building a shelter in Sungei Tengah big enough to house and give medical treatment to at least 400 animals; it even works with other animal welfare groups to give out grants to students for their own animal-protection projects. A baby chimpanzee named Rhamba started it all for him in 2000. Then a 21-year-old volunteer photographer for the zoo, he said he saw a keeper punch Rhamba in the face to discipline it. He tipped off The Straits Times, which reported the incident and started a groundswell of support from animal lovers who successfully campaigned for Rhamba to be returned to her family. The zoo denied this was a problem, but following the media publicity, it stopped isolating baby chimps from their families. Adding that zookeepers have come a long way since then, Mr Ng still considers the episode 'the best thing that happened in my life'. Inspired to do more for animals, he and eight friends started what would become Singapore's first wildlife protection agency, scraping together less than $1,000 in combined savings. 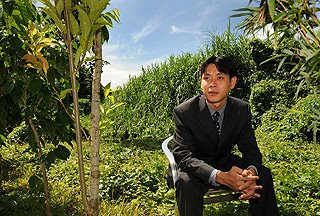 The National University of Singapore-trained biologist was then doing his masters in primate conservation part time with the Oxford Brookes University in Britain, but through sheer will and support from friends, he got Acres up and running on a shoestring in 2001. He and his team began by fanning out to give talks in schools. Public education is on-going. In the past seven years, Mr Ng estimated, Acres has reached out to over 200,000 people about animal abuse and how animals can be better protected. The group's efforts here have so impressed Law Minister K. Shanmugam that he agreed - on short notice - to speak at Acres' seventh anniversary celebrations last month. And here is the article published on January 28 2001 about the outcome of Mr Louis's action. THE days of being caged in are over for Poko, Gombe and Rhamba - Singapore Zoo's young chimpanzees, which pose daily for photographs with visitors. The zoo decided to end their confinement following an outcry by the International Primate Protection League (IPPL) and the World Society for the Protection of Animals. The three - aged between 1 1/2 and four years - are in a long line of chimpanzees which have helped popularise animal photography at the zoo for more than 15 years. Poko, Gombe and Rhamba were taken away from their mothers at birth and raised by the keepers. They were kept apart from the other chimpanzees, which lived in an open enclosure. After being trained to pose with visitors, they were kept in cages so that it was easier to produce them for photography. 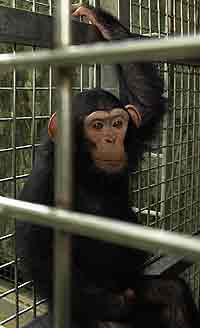 Times reported in November last year on the animal-welfare groups' attack on the caging of the trained chimpanzees. This was revealed by Mr Bernard Harrison, chief executive officer of Wildlife Reserves, during a visit last Sunday to the zoo by an IPPL director, Mrs Dianne Taylor-Snow. He said the young chimpanzees would not be separated from the rest of the herd again. So far, the three have responded well to the changes and have been accepted by the other chimpanzees. The Sunday Times saw them rolling on the grass and frolicking with other chimpanzees under the sun. The keepers do not have any problem retrieving them from the group for their photography sessions, which continue as usual. The zoo has also decided to immunise all young chimpanzees against common human diseases and asked keepers to explain to visitors the need for conservation. Conservationist Louis Ng, 22, who blew the whistle on the practice of caging the chimpanzees after witnessing a keeper allegedly abusing Rhamba, said the fight was worth it. 'I wanted to improve the conditions for the animals. Maybe I did it the wrong way, but that should not be the issue now. ON April 5, 2004 Rhamba, the Singapore Zoo’s celebrity chimpanzee, died during a failed escape attempt. She climbed over the electric barriers and was shot by a tranquillizer dart gun. But she still managed to run straight into a reservoir and drowned before the keepers could save her. This is what the New Paper reported on the 9th April 2004. Animal welfare activist Louis Ng had got to know the chimpanzee when he was a volunteer in 2000. He launched his first campaign to pressure the zoo to stop photo-taking with the chimps, claiming that he saw Rhamba being punched in the face to make her behave. He went on to set up the Animal Concerns Research and Education Society. Responding to Rhamba's death, Mr Ng said: 'To say that I am devastated is an understatement. 'I remember the times she would come and hug me, seeking comfort when times were hard. This is the newspaper report from Nov 7, 2000 which started the ball rolling for ACRES. BECAUSE of the outcry by animal-rights groups, Poko, Rhamba and Gombe - the three young chimpanzees trained to pose with visitors daily - will be getting a bigger cage. Mr Harrison said that although the cage in which they live is by no means 'squalid and small' - it measures 2 m by 2 m by 3 m - the zoo will be building a bigger one. 'To be honest, it is in relation to what has been going on,' he said. The three chimpanzees, raised by their keepers from young, have been kept apart from the rest of the chimpanzees which live in an open enclosure. They have been kept confined so that it is easier for the keepers to produce them for photography sessions. When the issue of the zoo's practice of using apes for photography was raised briefly at the annual World Zoo Organisation conference last month, Mr Harrison had said that he would review the zoo's policy and the way it keeps its animals. What does the life of Rhamba got to do with climate change? Plenty. To fight climate change is a long long journey. Louis's passion and his desire to fight for animal right is not a one night stand but a long term commitment. From 30 May to 3 June, a group of Mayflower Secondary School students including some of the ESS Army members went for the Vietnam Field Trip in which we were exposed to the economic and social changes of the country. Economically, Vietnam has been thriving due to the rapid development of the nation. Here, I am focusing more onto the social changes of the country which originated from environmental issue of Agent Orange. Agent Orange is a powerful herbicide and defoliant that contains dioxin. It was used by the U.S. armed forces to defoliate jungles during the Vietnam War. If people are exposed to it, health problems like cancer and genetic damage are inevitable. In Vietnam, there were many who suffered from birth defects for the rest of their lives due to this toxic spray. Some children and young adults in Vietnam are now under the care of Agent Orange Centre. Unfortunately, we were not allowed to visit them as they did not want the victims to feel mortified and helpless. However, we got the chance to visit a museum in which evidents of the impacts of Agent Orange could be found in photographs. Below are some pictures which, personally, pained my heart to see. A picture of a woman and her four sons, all Agent Orange victims. A picture of a father carrying his son, an Agent Orange victim, to school every day. Hung, 23-years-old, was born to deformity from his parents who were soldiers during the war against American in South Vietnam. An Agent Orange victim street vendor. "The consequences of spraying these toxic chemicals continue to have devastating effects on the environment. Millions of litres of Agent Orange caused a great ecological imbalance, destroying timber, wild animals and forest products. Without forest cover to retain water, flooding in the rainy season and drought in the dry season has adversely affected agricultural production. Topsoil is easily washed away, further hindering forest recovery. While the uplands have been and continue to be eroded, the lowlands have become choked with sediment, further increasing the threat of flooding." Last weekend, on the 7th and 8th, in Anchor Point B1, we had the opportunity to collabrate with the Youth Environmental Guardians, who was under the YMCA-CITIBANK Youth for Causes project, and the Enterprising Club to promote and sell our product: Shoo Mozzie. The profits gained from the sale all goes to ACRES. 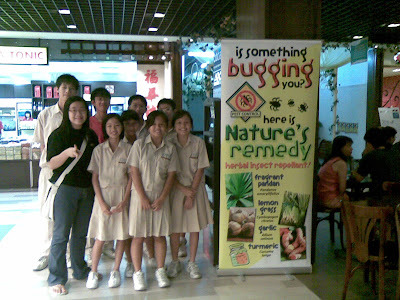 Together, we promoted Shoo Mozzie, the all natural insect repellent at Anchor Point where we were taking part in the Enterprising Retailing Team Challenge 2008. 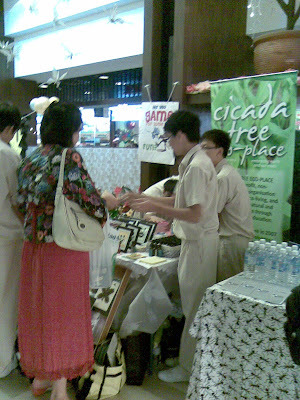 Other than Shoo Mozzie, we were also selling other products such as hand-made handicrafts. In the end, we were one of the top 2 teams which had the highest profit, and earn the gold award. 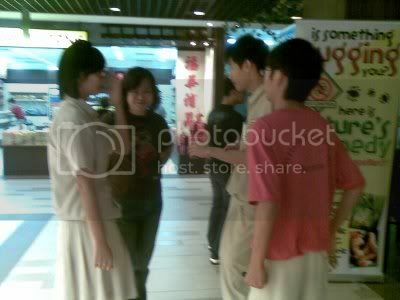 Here, Yuxi is persuading a potential customer into buying the Shoo Mozzie. 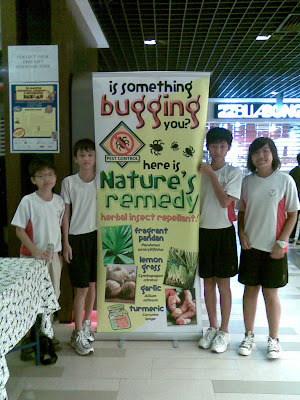 Helpers from the Enterprising Club also helped us promote the sale of this all natural insect repellant. The sec 1 YEGs are briefed and taught how to persuade potential customers. Here are the the sec 1s YEG who helped make the Shoo Mozzie. Now, they're eager to sell their product. In the afternoon, a second shift arrived to help sell our products and to give the first shift students a break. All in all, alot of experience was gained from this event. We look forward into promoting our cause and product and also collabrate with more groups and organisations. 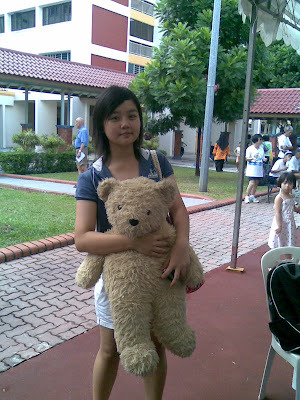 Dr Vilma Drozario is a lecturer at National Institute of Education (NIE). Although her job is not in the environmental sector, she has been involved in numerous nature conservation efforts since as long as ten years ago. The Ess Army, together with a couple of the school's YEG (Youth Environmental Guardians) and a number of enthusiastic schoolmates were honoured to be given a chance to interview her in May 2008. During our interview, Dr Drozario mentioned to us a factor that affects the earth’s climatic change, carbon footprint. It is the measure of impact of human activities on the environment, calculated by the amount of greenhouse gases produced in terms of carbon dioxide units. How did you first become involved with environmental conservation efforts? I got involved with nature conservation from 1998 onwards. As a child, my parents have always encouraged my love for animals, plants and nature. I have been a nature lover since a young age, but it was only in 1998 that I joined a nature lover society. I was very excited about learning more of animals and plants and in 2000, I became the chairperson of a nature society focusing on educational outreach for children, usually the younger ones between five to nine years old. We conducted and planned activities for five to nine year olds, such as Fun with Mammals, Fun with Insects, Fun with Frogs, Fun with Reptiles, mainly are focused on animals. For Fun with Mammals, for examples, what types of mammals? Usually, are the endangered ones. We taught the children what the animals eat, where they live, their ecology, habitats and problems that they are facing, relating to conservation issues such as what causes extinction. Actually it is deforestation. We also taught them how we could make a difference. For eight years I had been very much involved in environmental conservation efforts that concentrate on nature education and outreach for children. However, in the last two-three years, I realized the need to talk about sustainable development and global warming. These have captured everybody’s attention. Before Al Gore’s Inconvenient Truth, the problem was already there. It is just that now everybody is paying more attention to it. I feel that the time is right to look more into global warming, its effects and how to make a difference. So I found several people who think likewise and together started a new non-governmental organization, the Cicada Tree Eco-place (CTEP), whose one campaign is the use of Shoo Mozzie, which is an organic insect repellant that is more environmentally friendly than chemical ones. CTEP also promotes nature education because people now are very ready to lessening their carbon footprint. I think in Singapore, people are more ready now than ever before. The effort of lessening carbon footprint is more progressive now than ever before. I just felt that it is the right time for environmental education for people, but the root of my involvement is my love for animals and plants that my parents have nurtured since I was young. With the rate of global warming increasing, do you think people are becoming more or less aware of the problem? I think they are becoming more aware of it. It is so much in the news, probably because of government pushing new initiatives. Before, it was the NGOs that do the nature outreach programmes and speaks about sustainable development. Now, it receives a lot of governmental support, and universities are competing to promote environmentally friendly technologies. For example, next week, the President of Hungary will be coming to SMU to talk about sustainable development. Also, NTU and NUS are competing to promote environmentally friendly technologies. As educational and other governmental organizations are pushing these efforts, people are becoming more aware of it. Just now you mentioned about Shoo Mozzie being an organic insect repellant is environmentally friendly, but don’t you think mosquito nets are more efficient? Well, in the old days, people set up mosquito nets as there were no air-conditioners. Because it is now warmer than in the past, people now turn on the air-con and sleep, as it will be cooler and prevent mosquitoes from biting you. In the old days, people slept under mosquito nets. Sad to say, the use of air-cons is contributing to carbon emissions. Using mosquito nets is like going back to basic. When we go to the basic, there will be less carbon footprints, such as the advertisements on how HDB flats are going green and having more windows on MRTs or bus stops. Having more windows will mean that we do not have to use as much electricity for air-cons and we can open the windows for the air and light. I think there is a need to encourage architecture to go back to the basic. Do you think going back to basic will hinder development? Increasing carbon emissions seems to be the side effect of development that always comes by it. How should we balance between development and environmental conservation? Well, ways should be found and developed. Going back to basics does not mean not developing. New technologies that are eco-friendly should be encouraged, where spaces are open and bright, as in Singapore we are very lucky with no typhoons and cyclones. The worst we can have is lightning and very heavy rains. Buildings should be as open as possible. Another way is to plant more trees. Although Singapore is very green, some areas are still very hot. There can still be more trees, which will contribute to less air-cons usage, more carbon being used up by the trees and more oxygen in the air. This will definitely reduce carbon footprint. We should also encourage children to do everyday eco-actions. What are some eco-actions? Warming your air-con temperature is one way. 25-260C should be enough. Actually even 270C will also be enough as the air-con will make the air dry and you will not be sweaty. What do you think youths can do in environmental conservation? We should engage youths in planting trees. It would be great. You could encourage your family, classmates and your classmates’ family to reduce the usage of Styrofoam and non-biodegradable materials, and encourage them not to use disposables such as forks, spoons and plates. Start from family and school before reaching out to the community. This will already be a major achievement. It is not easy. You could implement the 3Rs by reducing, recycling and reusing the things we own. Instead of using plastic bags, encourage the people around you to bring a bag with them for shopping. Put it in your bag at all times and refuse plastic bags. You could make a campaign at school. We should look for bio-degradable containers. Recycling is also very important as it reduces the amount of new natural resources demand. The materials used in recycling, such as water, can be from reused water. In Singapore, people generally have more money than others in many parts of the world, thus we can buy more stuff. There is a website called the story of stuff. It is American-based, but is applicable to Singapore too. It shows how we keep buying more and more and more stuff, including a lot of things that we have but do not actually need. Birthday presents, for example, are lovely, but a lot are unused and cluttering the space. It will be better to get together for a quality time with family and friends on your birthday. This will cut down on things that we do not need. Do we really need so much of all the things we own? People talk about the 3Rs but they do not really understand it. Reduce. Share with friends how to do it, for example by taking down the amount you use per semester or per week and slowly cutting down the number. It is very hard to practice, yes, but it helps environmental conservation. Do you have any tips on planting trees at school? Well, you could go to a nursery and choose the native Singaporean plant. It would bring in wildlife into the school such as butterflies and birds, if you plant the right trees. Why native plants? Some foreign plants might not be suitable for local wild animals. If you plant native plants, they will provide food and nectar for the wild animals such as birds and butterflies at daylight and bats and moths at night. You can plant instant trees, but they are of course more expensive. The most important thing is that it has to be the right kind of tree. Do you have any opinions on how we should make people believe that global warming is real and not just part of a natural cycle? You could show good movies or DVDs. As youths, you could gather small groups of youths and show Arctic Tale, Inconvenient Truth, etc. It has to be a small group, not a big group. So, should you show the whole thing or parts of it? I think if you show the whole thing, most will fall asleep. Maybe you could show parts of the movies, followed by discussions. Make sure the discussions go down to what we can do and give examples of what you or other people are doing. You could ask them some questions and come up with suggestions on everyday habits to slow down the process of global warming. You are currently not in position to influence the government, but you could influence your friends. Lastly, do you personally support violence used in environmental conservation? You mean like Greenpeace? Well, depends on what violent actions they do. If in cases such as whaling, environmental conservation ships chasing and ramming into whalers, I am not against them. I will probably support them with funds. I do not believe in violence, but if I think a group is going all-out to support environmental conservation, I will support them. In 2001, Mr Joseph Lai, a botanist, stumbled across the beautiful beach in Pulau Ubin. The richness of the marine life left him bewitched. To his horror, he found out the area was about to be reclaimed. Together with the support of other conservationists, he made a plea to the government, fighting hard against the plan. After a long battle, he won. In May 2008, The Ess Army were honoured to have the opportunity to interview him, whom we found to be a very cheerful, kind and informative man, on his views on climate change and environmental conservation as a whole. Some people have opinions that global warming is just that the earth is balancing its temperature. What is your view on this? Do you think climate change is real? I think climate change is real. Basically it is not just a matter of balancing earth’s temperature. There were ages such as the ice age where natural processes caused mass extinction. It is quite a puzzle as to why such things happened in prehistoric time. Nowadays, however, the change in temperature is man-made, mostly due to consumer habits. One good example is deforestation. You know, the forests are the lungs of the earth. Deforestation is as if you take one lung away. This affect living things as a whole. Because of global warming, there is less of nature. It is killing off sea lives, especially the reefs near the shores, where most fishes live. They are part of a food chain, connected to the deeper ocean. This shows how land reclamation affects life on the deep ocean. We can tell the temperature of the earth is really going up. Other effects are shortage of food and a lot of natural disasters happening. How do you think humans should balance between development and environmental conservation? It is quite difficult. Every country wants to be developed. Singapore is among the upper half of the countries in the world, making us considered to be developed. However, there are still many countries, under-developed, who wants to develop themselves. It is impossible to stop development, but we can reduce the effect, such as by incorporating nature into the environment. Building casinos in Sentosa, for example, one is faced with the alternatives of destroying the coral reefs or think of alternatives. If one can do that, now that is good development. The problem is most developers think of profit first. They should rethink their strategies of development into “Earn less, conserve nature.” Conserve nature for the future generation, their own children. In Sentosa, the big corals just outside the underwater world will be killed by reclamation, and after they build the casinos they plan to dig some more to make something like the largest tank in the world. This destroys nature. This is wrong. What do you think is the most important thing to do in humans’ effort in environmental conservation? The 3Rs: Refuse, Reduce, Reuse. I did not say ‘Recycle’, which is done and said by everybody these days. It’s only a fraction, not everything can be recycled. Recycling brings more harm than good, as to recycle we need materials such as heat, water, and this means more demand on earth’s resources. So we turn to Refuse. An example of refuse, let’s say you have a handphone. You need not to change and buy a new phone despite new functions introduced by another phone model. In Refuse, we think of our own need first, whether it is important or not. Keep things simple. This will mean less waste. Reduce. For things that we cannot do without, that we cannot Refuse, we reduce. Let ‘s say you cannot live without drinking Coca cola, say, seven cans a day. You reduce it to three cans. That is reduce. Cut down the usage, meaning less demand. You do not need to stop completely. Probably you cut your demand halfway first, then after a few months, another half. As for reuse, you can reuse your bottles, clothes, maybe donating them to someone else. Keep the lifespan longer. How do you think youths can contribute to environmental conservation? Well, the simplest thing to do is to share with your friends what you have learned, any information about the environment. Then, of course you have to be a role model in the society. You cannot just talk but do nothing. Home is the best place to start. Encourage your parents to be more environmentally friendly, participate in environmental community services, put waste to the correct bins. When you grow up as working adults, then maybe you can start a movement. If you’re the boss of a company, for example, you can set a goal in your company to use 20% less paper. How can we compensate for irreversible damages caused by climate change? Pulau Ubin has been quite a tourist destination. Do you think the government will develop the place? If so, how do you think it will affect the nature there? If that happens, I would be very sad. At the present moment, people will go to Pulau Ubin and relax, as it is a very green and rural environment. During my parents’ time, it was a playground for everyone. If the government urbanises it, it will literally take it all away. There will be no more special nature areas. I don’t know, maybe Chek Jawa could be turned into another Sentosa. There will be more land demand, and more reclamation. We will lose everything Pulau Ubin has to offer. 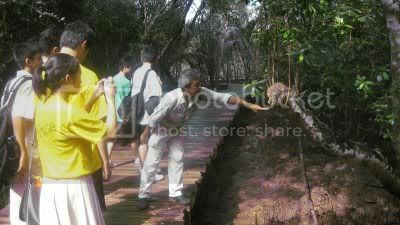 Do you think tourism will harm the nature in Pulau Ubin? No, no. The tourists stay within the boardwalk, and the system allows damage to be kept to minimum. And as people visit Pulau Ubin, they will see its beauty and have a sense of belonging. If the government plans to develop the place, they will probably stand up for it. If they do not know about the place, they will not care. At the moment, the natural environment in Pulau Ubin is very good. Actually there are not many tourists visiting Pulau Ubin. Not because it is not interesting, it is because people are not aware of it. Those who know are not promoting it. I am talking about the tourism board. They only offer entertainment units of a certain company, Temasek Holdings, such as the zoo, Jurong Bird Park. They all belong to the government. The Singapore Tourism Board is a state-driven organization. They know that the money they spent on promoting the tourist destinations will go back to their pockets. In Pulau Ubin, you cannot do that. When the tourists go there, the money will go to the villagers, the tourism board will get nothing. Our online survey was taken from 18 May 2008 to 5 June 2008 by 91 people aged 10-19 (90.10%), 6 people aged 20-29 (5.94%), 4 people aged 40 and above (3.96%) and one person who skipped the question to a total of 102 respondents. From 102 people who had taken our online survey, 79 are from Singapore (77.45%), 9 are from Indonesia (8.82%), 2 each from Australia and Vietnam (1.96% each), 1 from each of UK, US and Portugal (0.98%) and 7 are unknown (6.86%). Thank you for your generous support. The number in the brackets indicate the number of respondents to the question. Someone asked an interesting question on the tag. He asked "May I know how will picking up litter contribute to effort to combat climate change?...just trying to know more about climate change"
Here is a website that you can go to. It shows the link between climate change and picking up litter. In the late 1990’s, waste and litter reduction were very high profile issues in Nova Scotia, with the introduction of the Waste Reduction Strategy and the 50% diversion target. The province reached 50% diversion in 2001, but public interest has subsequently waned. Diversion levels are slipping below 50%, waste per capita is increasing and the number of disposable non-recyclable products on the market continues to rise. It is time to turn the spotlight back on waste reduction and to focus on consumption and buying patterns so that people choose to rethink and reduce first, reuse second and recycle third. Clean Nova Scotia believes that education is the key to protecting our environment for future use, enjoyment and economic benefit. We currently offer the Great Nova Scotia Pick-Me-Up, a provincial anti-litter program and Waste Reduction Week, a national campaign. We hope that after reading the website you will do you part and continue to keep the environment clean. Lim Chun Tat Kenneth, a member of the YEG in 2007, class 4J. There is still hope for Earth; more youths are becoming environmentally conscious today. While some youths are following fashion trends, there is another trend going on around the youths: be environmentally conscious. Worry no further about problems like global warming and pollution. Students like Tanya and Toh Yong Qing, both 16, are equally caring about the environment. 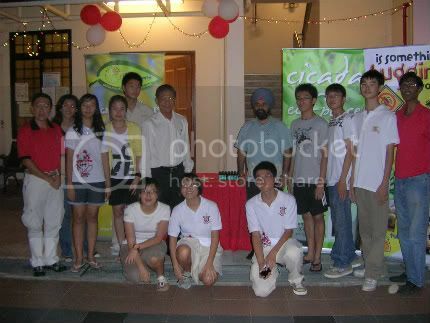 In fact, both of them are also working with Cicada Tree Eco-place, an environmental non-profit organisation. It seems the reason behind this recent trend is the media. Through channels like the Discovery Channel and the National Geographic Channel, youths are exposed to the negative impact human actions have on the environment. Thanks to the influence of the media, “Green groups” are growing at a much faster rate than 10 years ago. This means Singaporeans are more affluent and more aware of the environment now. However, although education also helps to spread such environmental messages, it is still not as effective as the influence of the media. Mrs Frances Ess, the teacher of Tanya and Toh Yong Qing, recalled teaching environmental issues for as long as 20 years ago, but youths are only taking actions after the premiere of movies like ‘Day After Tomorrow’ and ‘Inconvenient Truth’ as they have powerful visual images. But does it end here? For youths like Tanya, joining an environmental group is just the first phase, the next phase being spreading awareness to her family members back in Indonesia. “Indonesia is a heavily polluted country, so I want my family members to adopt a healthy lifestyle,” said Tanya. Although this is a good start, more has to be done as some youths are still wasting resources. There are also no signs to show that this trend will last for a long time. Miss Vilma D’Rozario, Sub-Dean, Student Development & Liaison, Foundation Programme Office, National Institute of Education, thinks this trend is only just the beginning as the youths have more in them. However, money might become an obstacle. Miss Celine Low, a co-founder of Cicada Tree Eco Place, encourages the public to show their support to the environmental organisations as such organisations provide platforms for youths to do a bigger part in saving the environment. 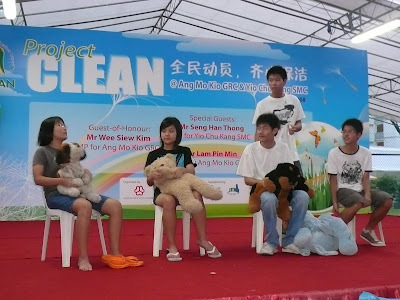 An example is the Project CLEAN organised by the National Environment Agency on the 24th May. “We are hoping to build a pool of young volunteers for outreach on equal living as well as to share to everyone an appreciation for our nature heritage,” Miss Vilma said, restating that the role of environmental organisations is to provide platforms for youths to spread the message of saving the environment. 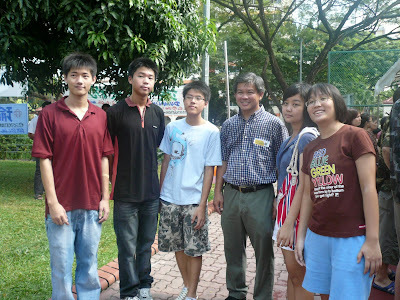 The students posing with the MP of Ang Mo Kio GRC Mr. Wee after the activities.